Western Digital’s WD has paralleled its HGST sibling and introduced an archive drive – but with just 6.3TB of capacity compared to HGST’s 10TB, 8TB and 6TB drives. Er, what? WD is branding its new drive the Ae, standing for, we think A(rchiv)e, and so moving away from its colours-focussed branding with Red, Green, Blue and Black drives. It’s a 6TB, five platter drive spinning at 5,760rpm and sounds like a worked-over Red drive, with its spec of up to 6TB, five platters and Intellipower rotation of 5,400rpm. The drive is said to be built with a progressive capacity model, meaning that as WD’s manufacturing processes get tweaked over time, the capacity is expected to rise, with a 6.1TB, 6.2TB and 6.3TB quarterly sequence mentioned. It has a 64MB cache, 6Gbit/s SATA interface and transfers data at a sustained 140MB/sec. WD says it has a 60TB/year workload. The drive has been specifically designed for archiving of cold, low access rate data. IDC’s VP for HDD research, John Rydning, says in a canned quote that it is a new drive, yet WD says it is a third generation product. Perhaps it means a third generation Red product, although the Reds are used in NAS applications. WD says the Ae has a 500,000 hour MTBF rating. For an archive drive, and compared to the 1.2/1.4 million hour MTBF or even higher numbers that we are used to with enterprise drives, this seems low. Archive drives are the last resting place for data and such data graves should last a long time. Also, it occurs to us that, although it’s an archive drive, with low power consumption a given need, there is no mention of spin-down in WD’s announcement. WD claims the drive has extreme areal density, without providing a figure. With a basic 6.1TB, five platter design that means 1.22TB/platter and that’s better than HGST’s He8’s 8TB, seven platter design with its 1.142TB/platter (664Gbit/in2). But the sampling HGST 10TB shingled helium drive may have 1.428TB/platter - if it is a seven platter drive. This seems all very well but having a cold storage rack filled with 10PB HGST helium/SMR drives would give active archive operators a much better storage density than using 6TB drives, even if the progressive capacity model delivers 6.1, 6.2, and then 6.3TB. No doubt WD’s pricing scheme for the Ae will reflect this. Seagate has nothing comparable to the Ae. Its Enterprise Capacitry drive is a 6TB, six platter design which spins at 7,200rpm. The 8TB Kinetic drive is thought to be a six platter design but we don't know its spin speed and it's not presented as a cold storage drive. 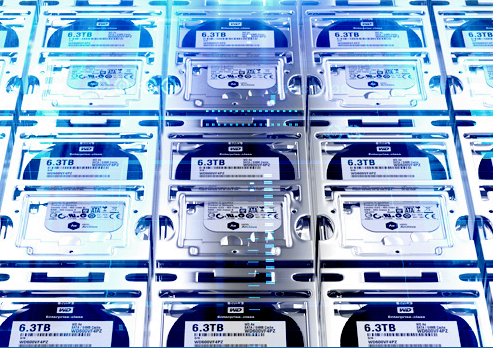 Both WD and Seagate, and also HGST, have a focus on cloud-scale data centres needing densely-filled racks of high-capacity 3.5-inch drives drawing low amounts of power. On a sheer capacity basis, WD is behind both HGST and Seagate.